I love Chinese food. It has been my comfort food right back from the time when my mom cooked fried rice, noodles and chilli chicken for me when I had just moved in to India as kid and refused to eat Bengali food. Then, while growing up and when restaurant visits in Kolkata were rare for us, I used to look forward to our annual visit to the local Chinese restaurant in Kolkata that my mother would take us to. My love for Chinese food grew stronger in Mumbai over Friday lunches of beef chilli and prawn fried rice at Leopold's, which formed the foundation of my courtship with my future wife. After we got married, I began to cook Chinese food at home. I have come a long way from the squishy noodles I fed her the first time. Then new friends made through my blog led me to Ling's Pavilion in Colaba, run by the sons of fellow migrants to Mumbai. It became, and continues to be, my favourite restaurant in Mumbai. As I grew older, I read that what we eat here is apparently 'Indian Chinese' and not 'authentic' Chinese. So I tried to get a feel of 'real' Chinese food in Chinese expat run places in Penang, Chiang Mai, Singapore and then Tangra in Kolkata, Sydney, Melbourne and Perth, London, Bern and Paris too. However, a niggling doubt remained in my head about whether this was the 'real thing' as expat food memories and renditions are moulded by the customs of their new homes and ingredients available locally and do tend to change over time. Which is why I jumped at the offer to go to eat in Hong Kong when I was invited by Cathay Pacific and the Mandarin Oriental Hotel Hong Kong to come on a fam (familiarisation) trip. Hong Kong is not 'mainland' China no doubt. Moreover Hong Kong is famous for its Cantonese food, which Ling's serves too, and there are, of course, many more versions of Chinese food. Still, this would at least be a start to my discovery of authentic Chinese food I hope and I was quite excited about the trip. We were in Hong Kong for around 4 days. While the experience was not exhaustive enough to make me an 'expert' by any means, I did come back with a belly full of Chinese food tales which I want to share with you. Our first meal, just after we checked in to the Mandarin Oriental Hotel, was at the Man Wah. This is its Michelin starred Cantonese restaurant. This was the first time I was eating at a Michelin starred restaurant. I had this image in my head of Michelin starred restaurants being very European, very expensive and very stiff, with complicated menus. Man Wah reminded me that perception is not always equal to reality. Well, I can't comment on the costs as the meal was hosted but nothing else in Man Wah matched with my preconceptions of a Michelin starred place. The restaurant offers Cantonese food as I said earlier and not European (there are restaurants serving Indian food internationall which have Michelin stars too). The vibe at Man Wah was very warm. There were Chinese families sitting and eating happily like you would see Indians do at the Bukhara for example. The restaurant is done up prettily with some lovely chandeliers (which MO had in plenty) and you can look onto the Hong Kong harbour over your meal. We were scheduled to have a dim sum lunch here. I confess that was a bit worried before landing in Hong Kong as I thought that I would only get to eat dim sums in Hong Kong and I am not a big fan of dumplings. As the meal at Man Wah progressed, I realised, that there are more to dim sums than just dumplings. I found out that 'dim sum' refers to small bites of food which go way beyond dumplings. Usually had with tea on the side. Most popularly eaten in the morning. Best had in groups. What I noted first about the dumplings at Man Wah was that the coating/ casings was a lot thinner and ethereal than in restaurants in India. I loved the Xia Long Bao, which we know and love back home in Ling's Pavilion as 'pork soup dumplings'. In Ling's you have to add the 'soup' (fermented soya wine) through a hole on top of the dumpling and then pop it into the mouth and this makes me jokingly call it a "Chinese phuchka". At Man Wah, and elsewhere here from I understand, the liquid is already infuded in the dumpling when i it is served to you. The coating thinner than in Ling's, the flavours very similar, the experience as euphoric. From what I understand, this dumpling is not of Hong Kong origin and belongs to Shanghai actually. There were more two standout dishes for me in the lunch at Man Wah apart from the Xiao Long Bao. One was something called a bacon puff which I don't have a picture of. The shape was conical, the texture was a bit foam-like or spongy. I mean this in form and not texture though and 'spongy' in a delightfully crunchy way and not in a bad way. The flavours of the bacon running through it was mind blowing. The other was a dish that I liked was one where rice had been fried till crunchy and then served in a lobster soup. The contrast of textures here was heady. Not disappointingly mushy unlike the soupy rice I once ate in a restaurant in Tangra, Kolkata, which put me off Tangra forever as it tasted like fyana bhaat gone wrong. The flavour of the broth in Man Wah was vibrant and the lobster in it tasted so fresh. This was a truly memorable dish for me. After the posh Michelin starred experience at Man Wah, our next encounter with local Chinese food was a lot more plebeian. This was at a place called Honolulu Coffee Cake Shop where we went with our guides from the Hong Kong Tourism Board. HKTB was in charge of designing our itinerary within the city and took good care of us. They had taken us out immediately after lunch at Man Wah on a day when our schedule resembled the 'pack as much as you can in one day' itineraries of the Kesri tour trips that my mom and aunt in law love to travel in. Soaks in the hot tub on my room at the end of the day at the Mandarin Oriental kept me going as I don't have her energy I am afraid. We were supposed to try out egg tarts here too but on lhearing my request to try local food, Vivian Wong from Hong Kong Tourism Board, our guide ordered more dishes. We had a pork chop bun which consisted of toasted hot dog sub sandwiched inside with tomato and mayo and char siu pork. 'Hong Kong' food was Vivian's classification of the dish when I asked here if it was 'Chinese'. We also had a flavour packed and juicy roast duck served with sticky rice and a mind-blowing roast pork noodle soup. The soup reminded me a bit of Japanese ramen but was clearer. The noodles a lot thinner than in the ramen I have had so far (not in Japan). The duck was quite tender and the spicing in it was so alluring. So brilliant compared to the tad dry and under-flavoured duck that I recently had in Mumbai. The far-east does meats, and a variety of it, so much better than here at times. The juiciness of the roast pork was epic. I slurped the bowl empty. I was happy and my smile said it all. We had the freshly baked egg tart at Honolulu which tasted pretty much similar to what we had eaten earlier at Man Wah. Both seemed to be of good quality. Egg tarts in Hong Kong are slightly savoury, slightly sweet, distinctly eggy. They don't travel too well I am told and you need to come to Hong Kong to have them freshly baked. We also tried something called pineapple bun - sweet buns with a thick layer of butter inside which reminded Shireen of the Verve magazine, a Parsi in the group, of the bun maska of Mumbai's Irani cafes just as did the atmosphere in the shop which was rather sleepy and Spartan. The food was soulful though. Joining these baked treats was some French toast which was mildly savoury like the Indian ones but to which you add honey here in Hong Kong which made it an east meets west sort of dish. The story did seem of these coffee shops like that of the Irani cafes of Mumbai. The one place Hong kong food lovers like Dr Pradeep Rao said I must go to when they heard that I was going to HK was what they referred to as, "a tiny place called Tim Ho Wan where people queue up for dim sums. It's the world's cheapest Michelin starred place." Well, It seems that Tim Ho Wan has grown since its original 20 seater at Mong Kong in Kowloon and has multiple branches in Hong Kong and internationally, more than one of which have Michelin stars. Vivian took us to the outlet at Sham Shui Po after hearing that I wanted to visit Tim Ho Wan. Thanks to her, we managed to skip the queues to get in and went up to the dining room upstairs where HKTB hosted us. The room was rather simple and we sat around a typical round table which you can turn and revolve to grab the dish of your choice. Vivian had a little surprise for us as we got to meet the founder of Tim Ho Wan, chef Mak Kwai Pui here. A thin, smiling gentleman, simply dressed with no airs around him. He normally works out of the Sham Shui Poi outlet I am told. Vivian acted as an interpreter. I asked chef Mak about what had motivated him to leave the 3 Michelin starred restaurant restaurant that he ran at the Four Seasons hotel to start his tiny dim sum outlet. "I wanted to retire," he shyly grinned and replied. Vivian said that the chef wanted to make his cooking accessible to regular (read non-five star) diners too and hence set up his first restaurant in Mongkong which, from what I understand, is not a very swanky area of Hong Kong. His passion to feed people great food at affordable prices turned a winning formula. I tried the baked pork buns that Ti Ho Wan is most famous for, and that Pradeep said I must have. I just loved the slightly firm texture of the casing rendered by the baking, which I felt contrasted and complimented the pork filling inside more compared to the traditional soft buns in steamed char siu buns. I also had my first taste of chicken feet here. Grilled in black bean sauce and served by itself and then separately with pork spare ribs over steamed rice. I quite liked it. Reminded me of chicken wings because of the juiciness of the bones and the similar texture of the skin. There was a noodles dish too apart from a variety of dumplings and spring rolls as well, washed down with hot tea. "All dim sum? Noodles, rice, ribs, feet, spring rolls too?" I asked Vivian. "That's right," she replied. "All dim sum." And all rather good I must say. I have heard people in India say that Cantonese food is bland. Well it is full of flavour for sure and hardly 'bland' if you ask me. Yes, no oiliness or chilli heat or masala overdose for sure but if you put that aside and treat it as a cuisine different from North Indian restaurant food (which it is), then you will appreciate Cantonese food a lot better. Our last Chinese restaurant experience, before we left Hong Kong, was in the outskirts of the city and happened by chance. We'd gone to see the giant Buddha statue on the hill on our way to the airport. When I saw how the Buddha statue had become a tourist hub, I wondered if this tourist focus is part of the vision for the Shivaji Statue planned outside of Mumbai. I hope someone has the foresight to think of that. We were scheduled to have a vegetarian meal here which is served to the monks and can I confess that I wasn't too keen on that? Well the Buddha listened to me. It turned out that the folks manning the food stall were on their lunch break and we were on the clock and couldn't wait. Vivian, who knew what we liked to eat by now, took us to the nearby Ngong Pong restaurant. The place is meant for tourists and visitors to the temple no doubt but we still ended up having a brilliant meal. We started with a juicy and flavourful roast goose, a dish many had said I must try in Hong Kong. The goose at Ngong Ping was cooked till very very tender. I was glad I got to taste it, and a good version too, before leaving. We also had a siew yoke. A pork belly dish that I had earlier eaten in KL. The pork here was hearty, fatty and rather seductive and deliciously flavoured. There was still silence at our table after our food arrived. A silence which is in reality a thunderous applause for the chef. The most memorable dish of the afternoon for me was what followed the glorious meaty starters and was actually vegetarian! This was an amazing delectable noodles dish with tofu and mushroom added to it. The flavours were so operatic that I didn't miss the absence of meat at all. The noodles were thin and crunchy, egg noodles though so not entirely 'veg' by Indian standards. The dish reminded me a lot of the pan fried noodles at Ling's Pavilion in taste and that was the taste of Hong Kong that I carried with me to the airport and then to Mumbai. The one dish that folks had recommended and that I didn't get to try at Hong Kong was the dan dan noodles which is made in a pork soup and crushed peanut broth. Vivian told me, and the internet agreed, that it is more a dish from Shanghai than Hong Kong. I got to try it at the Noodle Bar at the Pier, the business class lounge of the Cathay Pacific at the Hong Kong airport where I had a steaming bowl of dan dan noodles after a refreshing shower and before walking some hundred miles to catch my Dragon Air (Cathay Dragon now). The airport is quite a large one so I had to walk quite a bit from the lounge I was at to where the Cathay Dragon flight for Kolkata took off. So if you do use the lounge, do check with the desk about the time that it would take to reach your gate. In my case, I was informed when I registered. The soup was hot and creamy and nourishing, thicker than ramen in consistency and very flavoursome and I didn't add any sauce to it. I figured out later from the internet that the Shanghai version is possibly oilier and spicier. Having had some very average food at the Mumbai CSIA lounge on my way to HK (though we got a free foot massage there), I was quite impressed by the quality of the food at the Pier. 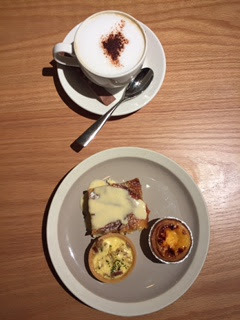 Even the bacon tart that I had earlier and quiche and bread pudding and Illy cappuccino here could match up to the food from a top class five star hotel restaurant. The dan dan noodles at Pier was a fitting goodbye from Hong Kong though I know I have to return for the chilli crab that my friend Soumik had recommended and also to try its street food as I missed that completely in this trip. Before I had left for Hong Kong, folks had told me I will not have single bad meal there. I was worried about eating only dim sum and dumplings in Hong Kong because of what I read before I landed there. I need not have. Do read the footnote and the photo posts that follow to know more on this, especially the seductive French foie gras soup. And how was my Chinese food experience in Hong kong? I did experience new dishes here and got to understand Cantonese food better. Were the flavours very alien? Not really especially after all the Chinese food I've eaten across the world so far. What I got to taste was more like comfort food for me than intimidating actually. My little visit to Hong Kong did make me even more hungry to now head to Mainland China for sure.